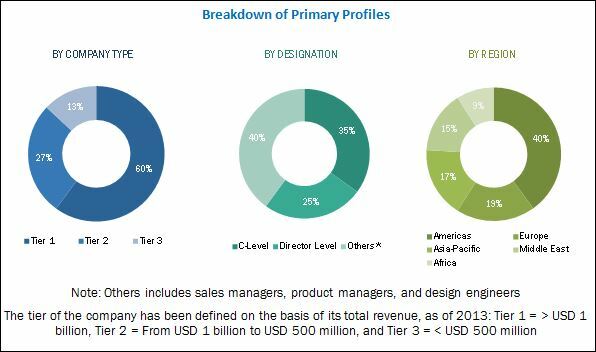 [146 Pages Report] The global surge protection devices market is valued at USD 2.06 Billion in 2017, and is expected to grow at a CAGR of 5.47%, from 2017 to 2022. The growing demand for surge protection systems for electronic devices, power quality issues, a rise in alternative energy programs, and cost escalation due to frequent equipment failures are the major factors driving the surge protection devices market. This research study involved the use of extensive secondary sources, directories, and databases such as Hoover’s, Bloomberg Businessweek, Factiva, and OneSource to identify and collect information useful for a technical, market-oriented, and commercial study of the global surge protection devices market. Primary sources are mainly industry experts from core and related industries, preferred suppliers, manufacturers, distributors, service providers, technology developers, standard and certification organizations of companies, and organizations related to all the segments of this industry’s value chain. The points given below explain the research methodology. Analysis of market trends in various regions and countries by studying the end-users of surge protection devices in the industrial, residential, and commercial applications. The ecosystem of the global surge protection devices market starts with the manufacturer of basic components, such as copper and aluminum. The manufactured parts are then assembled by the OEM to form surge protection devices, which are then tested. This is followed by the distribution stage, following which the product is provided to the end-users. The surge protection devices market is expected to grow from an estimated USD 2.06 Billion in 2017 to USD 2.68 Billion by 2022, registering a CAGR of 5.47%, from 2017 to 2022. The global market is set to witness significant growth due to growing demand for protection systems for electronic devices, power quality issues, a rise in alternative energy programs, and cost escalation due to frequent equipment failures. The report segments the surge protection devices market, by type, into hard-wired, plug–in, and line cord surge protection devices. The plug–in SPDs segment is projected to dominate the surge protection devices market. The growing demand for primary protection of equipment from surges is driving the market for hard-wired surge protection devices. The report segments the surge protection devices market, by end user, into industrial, residential and commercial. The industrial segment is expected to grow at the fastest rate during the forecast period. The Industry 4.0 initiative is being applied to vehicles and electrical machinery in order to facilitate remote diagnostics, remote maintenance, and remote data capture. Such initiatives have increased the need for datacenters, servers, and communication systems. With the increasing use of electronic equipment, the need for protection systems for such critical equipment has been increasing. This is driving the market for surge protection devices in the industrial segment, which is expected to create new revenue pockets for the surge protection devices market during the forecast period. In this report, the surge protection devices market has been analyzed with respect to five regions, namely, North America, Europe, Asia-Pacific, South America, and the Middle East & Africa. 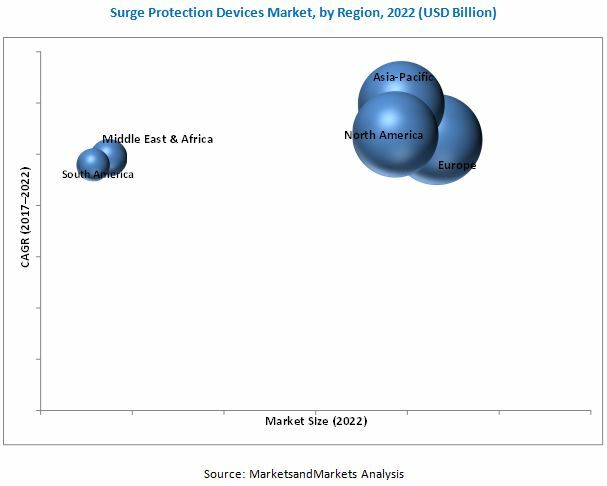 The European market is expected to dominate the global surge protection devices market during the forecast period. Industry 4.0 is a European strategic initiative to digitally transform the industrial, IT, and manufacturing industries. Intelligent ICT-based machines, systems, and networks, capable of independently exchanging and responding to information to manage industrial production processes, are being implemented for production efficiency. There is an increasing trend of manufacturing facilities shifting their operations to low production areas such as Eastern Europe. Manufacturing, along with construction, mining, and quarrying, in Eastern Europe, is on the rise, making Europe a lucrative market for surge protection devices. The market in Asia-Pacific is expected grow at the highest CAGR during the forecast period. The region is moving towards clean energy on a large scale in order to meet its growing energy needs in an efficient way. India, China, and Singapore are some of the potential growing markets in the power and utilities sector. Also, Asia-Pacific offered the biggest potential gains for foreign direct investment, and attracted 45% of all capital investment, globally, in 2015. Increased investments in modernizing infrastructure and urbanizing populations, especially in developing economies such as China and India, is expected to drive the Asia-Pacific surge protection devices market. 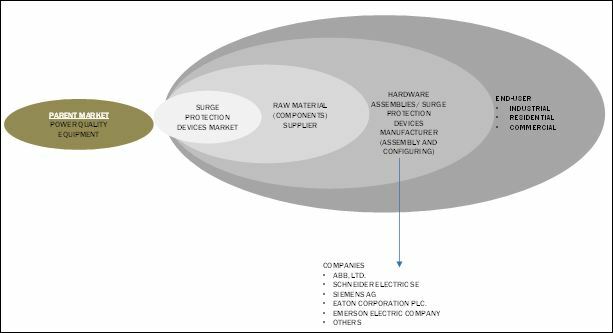 In this report, the surge arresters market has been segmented, on the basis of type, into station class, intermediate class, and distribution class, and on the basis of voltage into low and medium voltage, high voltage, and extra high voltage surge arresters. The market has also been segmented, on the basis of region, into North America, Europe, Asia-Pacific, South America, and the Middle East & Africa. The market for surge arresters is expected to grow from an estimated USD 1.49 Billion in 2017 to USD 1.91 Billion by 2022, at a CAGR of 5.11%, from 2017 to 2022. Although some cost bearing constraints in the installation of surge protection devices are being observed, emerging economies are expected to create better opportunities for the surge protection devices market. Poor design parameters and misleading assumptions, inappropriate testing, and safety issues are expected to be major challenges for growth in the surge protection devices market. The leading players in the surge protection devices market include ABB, Ltd. (Switzerland), Siemens AG (Germany), Schneider Electric SE (France), and Emerson Electric Company (U.S.). New product developments was the strategy most commonly adopted by the top players, constituting 87% of the total developments from 2013 to 2016. It was followed by mergers & acquisitions, contracts & agreements, and awards and recognitions. 12.9 Advanced Protection Technologies, Inc.
12.11 Leviton Manufacturing Company, Inc.